Over 300 days of sunshine every year. Unless you choose to get married in the winter months, sunshine on your Cyprus wedding day is virtually guaranteed! It's only just over 4 hours away from the UK which makes it far easier and cheaper to get to than the Caribbean. English is widely spoken in Cyprus, ceremonies are conducted in English plus your marriage licence and all paperwork will be in English too. You do have to pull together certain legal documents before the wedding but the process is pretty straightforward. 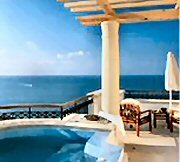 Aphrodite's island of love is a romantic choice for both the wedding AND the honeymoon plus your guests can have a great holiday too. You can even have your hen and stag parties on the island! No matter what the budget is for your island wedding Cyprus has something to offer, whether you organise everything yourself, you choose a "tour operator" wedding or you decide to employ a wedding planner in Cyprus. You can choose from a variety of Cyprus wedding venues to make your day even more special. Why not try something different like a sunset wedding cruise or, after taking your vows, keep it simple and just have a party on the beach! It is often much cheaper to get married abroad and not just because costs in foreign countries are less. Do it yourself. If you know the island well and you have the time or friends/relatives on the island to help you, then this option is usually the best for a cheap destination wedding in Cyprus. It can also be the best way to personalise your special wedding day. 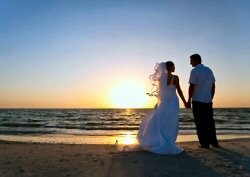 Book your Cyprus wedding through a tour operator. If you can't face the stress and hassle of organising an overseas wedding yourself, then this could be an option for you. With traditional package holidays on the decline due to the ease of booking everything yourself online, more and more tour operators are offering wedding packages. The disadvantage, of course, is that you will only have a choice of venues that are linked with the tour operator and there is limited scope to personalise your wedding day. Employ a wedding planner. 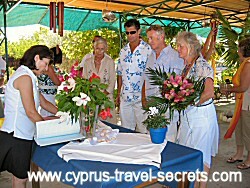 Cyprus has a large number of specialist wedding planners based on the island. They offer various services from just organising the Cyprus wedding ceremony and transport to organising an entire package including hen and stag parties. You are only limited by your own imagination and budget! If you want to get married in Cyprus, it's worth taking time out to consider WHEN to get married. Tip: Remember that it is VERY hot and it can be humid too in July and August. All civil ceremonies take place before 2pm so you can imagine how warm you might get, even in a cool summer dress. Cypriots, of course, love summer weddings Cyprus style... they don't normally start until after 6pm and sometimes go on all night.